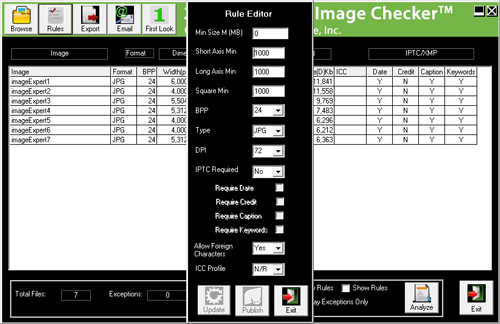 Image Inspector is a pre-flight analysis tool that allows you to run a batch of images against a set of rules that you devise. These rules include things like image size, dpi, image weight, ICC profile, IPTC, etc. Image Inspector is an integral part of Image Expert, allowing you to pre-test all uploaded images to insure that they meet minimum standards.